We’ve built a reputation for fast-service. Our short lead-time means that customer orders can be processed and at their dock in less than one week. Our production capabilities allow us to maintain multiple manufacturing lines, each running three shifts, to meet all our customer needs. We are the innovation leaders within the category which enable us to offer our customers not only the best product but also ones that are on the leading edge with the ultimate consumer. We are nimble and can turn around customer ideas in days. 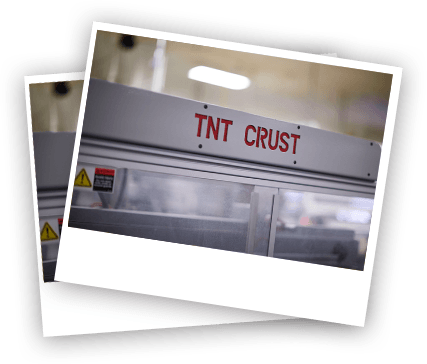 Some in the industry think TNT means “The Next Thing”, as we are always looking forward to the next creative crust idea. Our customers are always #1 to us, and we will do whatever is needed to ensure our customer’s needs are met 100% of the time.